LONDON (Reuters) - The Bank of England said on Thursday that interest rates might need to rise a bit faster than investors expect, but it warned that all bets would be off if Britain leaves the European Union without a deal in less than five months. 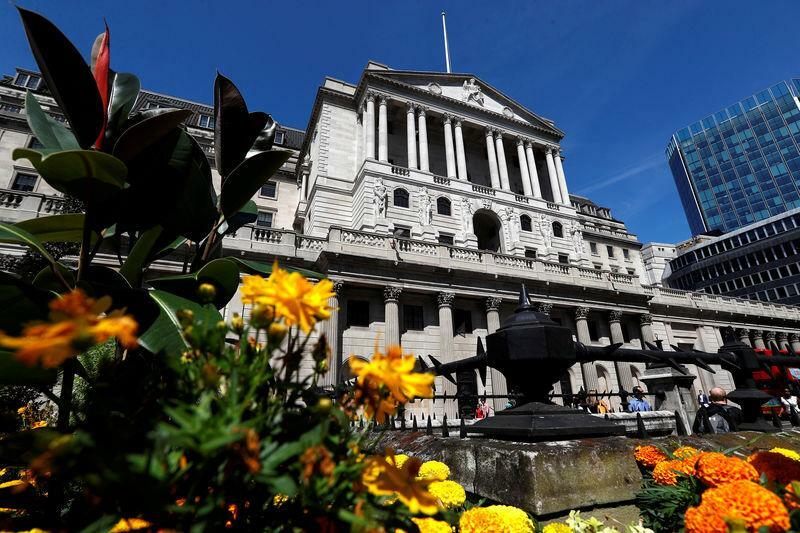 The BoE's nine rate-setters all voted to hold rates at 0.75 percent, as expected in a Reuters poll of economists, after raising them in August for only the second time in a decade. Governor Mark Carney said the BoE did not expect a disruptive no-deal Brexit, but if it happened, the central bank would be in uncharted territory and it was not possible to predict if rates would need to rise or fall in response. Brexit is dominating the outlook for the world's fifth-largest economy which has slowed since 2016's referendum. "Since the nature of EU withdrawal is not known at present, and its impact on the balance of demand, supply and the exchange rate cannot be determined in advance, the monetary policy response will not be automatic and could be in either direction," Carney told a news conference. The BoE cut rates and ramped up its bond-buying programme after the shock referendum vote. Carney cautioned against assuming it would do the same in the event of a no-deal Brexit. Unlike 2016, inflation is above target and the BoE would be responding to actual economic damage, not a fall in confidence. Sterling would probably fall and push up inflation. Combined with a hit to supply chains and possible trade tariffs, that would argue for raising rates, Carney said. On the other hand, policymakers would need to balance the hit to growth from lost trade, uncertainty and tighter financial conditions. That would normally make a case for lower rates. Sterling briefly edged up against the dollar after the BoE policy announcement and was on track for one its biggest daily gains this year due to optimism about Brexit talks and broader dollar weakness. The BoE pencilled into its forecasts the bets in financial markets that there will be almost three quarter-point rate rises over the next three years. That compared with just over one in the forecasts that accompanied August's rate rise. Asked whether investors were pricing in enough rate hikes, Carney pointed to the BoE's forecast that inflation would still be above its target in two years' time, suggesting he thought investors were being a bit too cautious about the pace of hikes. "November's statement makes it pretty clear the Bank of England would like to be hiking rates further," ING economist James Smith said. "But given that it may be quite some time before we know for sure that a no-deal Brexit has been avoided, we suspect policymakers will struggle to hike rates before May 2019 at the earliest." Most economists do not expect rates to rise again until the middle of next year. The BoE said consumer spending had beaten its expectations but businesses were holding back on investment. Prime Minister Theresa May has yet to secure a transition deal to ease Britain's exit from the EU. Assuming Brexit goes smoothly, the economy was likely to continue to grow by around 1.75 percent a year, the BoE said, below the rate of above 2 percent before the Brexit vote. But the BoE said the economy was at full capacity and inflation would take three years to drop from 2.4 percent now to its 2 percent target. The economy was expected to start running above capacity in late 2019, sooner than the BoE previously forecast, creating inflation pressure. The forecasts did not include the stimulus from higher public spending and tax cuts in finance minister Philip Hammond's Oct. 29 budget. Like Carney, Hammond has said he might need to review his plans after Brexit. "The (BoE) would be minded to offset such additional demand by raising interest rates a little more rapidly than the 'one hike per annum' over the next three years, which it is guiding towards," Investec economist Philip Shaw said. Has NVR, Inc. (NYSE:NVR) Got Enough Cash?